The following veterans have unexpectedly become starting fantasy baseball daily first basemen in many leagues, or are still eligible in fantasy baseball leagues due to having fantasy first base experience in the past. Cuddyer, now 34, hit 32 homers with 94 RBI in 2009 but has hit more than 20 homes just one other time. When he came to Colorado in 2012, the combination of Coors Field and second base eligibility in many leagues made him an intriguing fantasy option. Injuries limited Cuddyer to 358 at bats, but he did hit 16 homers with 58 RBI while batting .260. In 2013, Cuddyer lost his 2B eligibility and has primarily played the outfield, but he still has eligibility at first base. As of June 30, Cuddyer was on pace for a career year, hitting .346 with 14 homers and 48 RBI. He was hitting .372 at Coors. But Cuddyer has already been on the disabled list once this year for a neck injury and was battling a rib injury in early June. Loney made a strong impression in 2007 when he hit .331 with 15 homers in 344 at bats for the Dodgers at the age of 23. That year, he had a .919 OPS. But Loney failed to hit .300, reach 15 homers or have an OPS over .800 in his next four seasons. In 2012, Loney was sent to the Red Sox as a minor piece in the blockbuster trade that landed the Dodgers new first baseman Adrian Gonzalez, Carl Crawford and Josh Beckett. Despite switching his home park from Dodger Stadium to Fenway Park, Loney’s production went down with the Red Sox, as he hit .230 with a .574 OPS in 100 at bats before Boston let him leave as a free agent. Signed at a discount by Tampa Bay, Loney, who turned 29 in May, hit .373 in April and hit .306 in May with six homers and 17 RBI. Loney got off to slower start in June, hitting .283 with 2 homers. As of June 30, Loney was hitting .314 with nine homers, 40 RBI and 34 runs. Morales had a breakout year in 2009 with the Angels, hitting 34 homers with 108 RBI and a .306 batting average. But a serious ankle injury in May 2010 put Morales out of action until 2012. 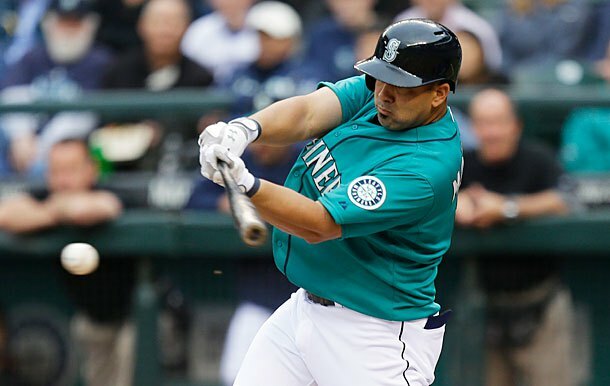 After hitting 22 homers with 73 RBI and a .273 batting average in 134 games, Morales was traded to the Mariners. Despite playing his home games in Seattle, Morales was hitting .278 as of June 30 with nine homers and 42 RBI. Ben Hargrove writes on fantasy baseball daily topics for sites like DraftStreet.com.